In the years following World War II, former Secret Service employee Mirabelle Bevan has found a refuge in the quiet coastal town of Brighton. But she can’t seem to resist an attraction to danger and a thirst for justice . . .
1952: Eighteen-year-old debutante Rose Bellamy Gore was last seen outside a Soho jazz club in the company of a saxophone player named Lindon Claremont. Now her mysterious disappearance is front-page news in the London tabloids. When Lindon turns up the next day in Brighton, desperately seeking help, Mirabelle counsels him to cooperate with the authorities. 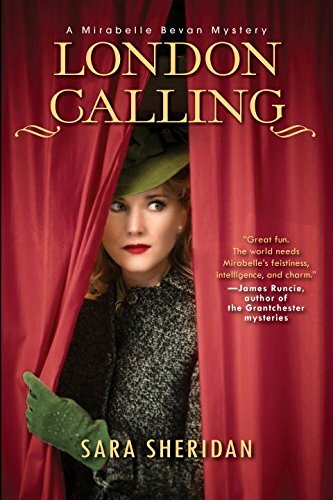 After the local police take the musician into custody and ship him off to Scotland Yard, Mirabelle and her best friend, Vesta Churchill, hop a train to London in search of the truth. Mirabelle Bevan and Vesta Churchill are an unlikely investigative duo in England the years after WWII. It’s 1952, the war is over, Mirabelle’s lover has been dead for 3 years, she’s taken over McGuigan and McGuigan Debt Recovery, and hired Vesta as her assistant. In the war, Mirabelle worked in intelligence. What she didn’t glean from her position was taught to her by her lover, Jack. This mini education has borne fruit in Mirabelle and Vesta’s adventures so far. Jazz is taking England’s youth and youthful minded by storm. The clubs that feature the music are described as dives and the musicians aren’t thought much better of than the venues they play. Lindon Claremont, sax player and childhood friend of Vesta, turns up at the Brighton office on the run from London. Rose Bellamy Gore has been kidnapped and the police suspect Lindon. After hearing of Vesta’s previous crime solving, he comes to her seeking help. LONDON CALLING takes Mirabelle and Vesta away from Brighton to London. From the tony neighborhood of Belgravia to the slums of the East End, they seek Rose and answers about the who and why of her disappearance. Mirabelle and Vesta, despite the odds and danger, are determined to get justice for all involved, one way or another. For Vesta, this one’s personal. Mirabelle, always dignified and elegant; Vesta, bright, lively, and highly observant. These two are perfect foils. They manage to keep their cool and their class, not always easy. Their “cases” are always deep and twisted, keeping readers guessing. The addition of a new character and a spaniel pup show promise. The era has never been an especial favorite, but I’m becoming quite fond of it when Mirabelle and Vesta inhabit it.